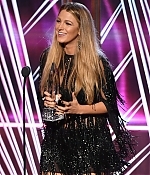 Blake wins People’s Choice Award! Blake may not have brought her handsome husband Ryan Reynolds to the People’s Choice Awards, but she made it perfectly clear he belongs to her. Accepting the award for Favourite Dramatic Movie Actress for her role in The Shallows, the star slipped a special mention into her speech. “Thank you to my husband, he’s everything to me,” she said. That’s when a fan began screaming at the mere mention of Reynolds. “You can’t have him, he’s mine!” Blake yelled in jest. The Gossip Girl star beat out other leading ladies Amy Adams, Emily Blunt, Julia Roberts, and Meryl Streep for the gong. During her speech, she also took the opportunity to send a powerful message. “My mum, she always taught me as a kid that you can’t ever let anyone limit you. Don’t ever let anyone tell you there’s something you can’t do,” she said, adding her first goal as a youngster was to join the Spice Girls. She thanked voters for “sending a message to Hollywood that people want to hear stories about women”. 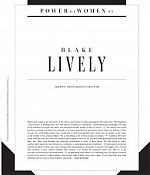 Blake recently appeared on Live! With Kelly and co-host Fred Savage, you can watch the interview, here. We also added x289 screencaps to the gallery, and while we were at it, we capped a bunch of other recent interviews too – enjoy! Check out the new (second) trailer for The Age of Adaline, plus x76 HD screencaps, here.